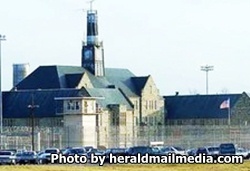 Maryland Correctional Institution Hagerstown is a medium security institution that houses over 2050 adult male inmates. The average sentence for inmates incarcerated here is 6.5 years. This facility is best known for it's architecture and the fact that the prison was built by inmates from stone quarried locally. Inmates can work in various jobs while incarcerated including working in meat processing, upholstery, recycling, metal work, and laundry. This facility also serves as a hub for ICE inmates who are awaiting court proceedings and serves as a parole hearing institution for the region. Inmates can earn a GED while incarcerated and take classes in reading, writing and math. Vocational classes in carpet cleaning, upholstery, computer courses, and sheet metal fabrication are available. Offenders can also take a six month substance abuse treatment program. One of the more unique programs offered at Hagerstown is training service dogs for wounded veterans. Inmates are allowed a maximum of three adults and three children per visit. General population inmates are allowed two visits each week, disciplinary segregation inmates are allowed a single visit each week. Weekend visits will be decided by the last digit of the inmates ID number. Inmates with odd last digits will have odd visiting days, and inmates with even last digits will have even visiting days. General Population inmates have visits on Mondays, Saturdays, and Sundays from 8:30am-2:30pm. Protective Custody inmates have visitation on Saturdays and Sundays from 4:45pm-6:45pm (registration begins at 4:15pm and ends at 6:15pm, so you must arrive and be registered by 6:15pm to be admitted to visitation).